Robertson Custom Homes has been building the finest homes in the Austin area since 2000, and has built a reputation as a company that has the experience you desire - yet is still small enough to give you the attention you deserve. We are excited and motivated to help you realize your dreams of building a truly custom home. We feel that the only way for you to get your dream home is for you to take an active role in guiding the design and construction. To help you take that active role, we created a home building company that encourages and prioritizes your participation. By having these trusted business relationships, we are able to deliver the highest quality craftsmanship, at an affordable price. We strive to meet your every need, and will be happy to meet you at your property (or help you find that perfect piece of land), and offer a no fee consultation to see if Robertson Custom Homes is right for you. 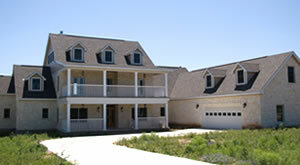 With no set floor plans, and no set locations, we will guarantee that you get your dream home. Contact us today to get started on your home, your way! Dave R. - Wow, what an amazing experience! Robertson Custom Homes delivered on time and exceeded my expectations. Thanks Michael! Mindy W. - Robertson Custom Homes is amazing - we finally have our dream home and we love it!